Vancouver, British Columbia, Coast Salish Territories – (November 13, 2015) – A broad coalition of northerners, environmental groups and First Nations today applauded Prime Minister Trudeau for his act of leadership in directing Transport Minister Marc Garneau to formalize an oil tanker ban on the North Coast of British Columbia, effectively stopping the Enbridge Northern Gateway pipeline. Trudeau’s decision was heralded by groups as the best way to permanently protect northern British Columbia’s ecosystems, rich biodiversity and economy from the risk of oil spills as well as further proof that tar sands pipeline proposals are far from ‘no brainers’ — BC is already feeling the impacts of climate change and projects like Enbridge Northern Gateway would lead to worsening wildfires and drought. 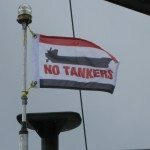 Coastal First Nations have already declared a ban on oil tankers on the north coast and recently issued a media statement supporting the federal government’s commitment to do the same. Since November 4th, the Dogwood Initiative has collected more than 15,000 signatures on a petition calling for a legislated oil tanker ban on the Pacific North Coast. The coalition, along with labour, faith groups and businesses, today sent an open letter to Prime Minister Trudeau supporting the government’s commitment to legislate an oil tanker ban on the Pacific North Coast, which would spell the end of the embattled Enbridge Northern Gateway proposal and create a new era of hope in BC.